Oh, book art. What would I do without you? I dog ear the pages of books. I do it to save my place or to mark a favorite section. I also have about a million bookmarks, store-bought, friend-made, receipts from foreign countries, train tickets, cool pieces of paper or ribbon, and anything else that can conceivably be used as a bookmark. But sometimes I dog ear instead, because sometimes that’s what feels right. I write in the margins. Marginalia is one of my favorite words. Isn’t it beautiful? I bracket my favorite passages and underline beautiful sentences. I draw hearts and sad faces. I often wish I could keymash. Sometimes “asglkhasgl;akhsglaks” says more than real words can. I bend paperbacks when I’m reading. I leave them open page-down on a table when I get up for a moment. I don’t see it as breaking their spines. I see it as breaking them in, like shoes you’re going to rely on for years, shoes that will take you places. I relish the long white lines on the spines of well-read books. And you know what? I feel no shame. All the time, I see people talk about how horrifying it is to do such a thing to a book. They could never do that! It’s disrespectful or hurtful. And that’s fine. If your method of showing love to a book is to keep it pristine, I respect that. But I believe that books should be interacted with. I love going back to a book and seeing all the little things left behind by me or another reader entirely. What did that last reader (even past me) love and hate? What did they have to say? Where did they stop reading? Which page corners were so often folded that they’re almost coming off? It’s a journey, just like the story. Well-read and well-marked books are one of my favorite things. 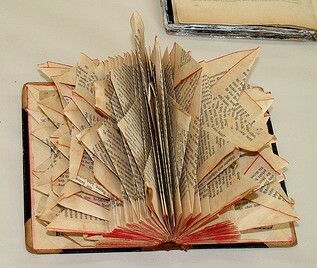 I would like it it other book-lovers would stop acting like dog-earing pages makes me some heathen. I’m an avid reader, just like you. I just read a little differently. Note: This post was originally posted on my Tumblr, but this topic has been on my mind and I decided to edit it and post it here. And now a quick writing check-in. From 1/23 to 1/29 I wrote 5090 words, with two zero days. Both stats are way better than last week. Let’s hope that’s not a fluke. It might horrify some people, but for me it’s one of the beauties of “real”, made-of-paper books! “I bracket my favorite passages and underline beautiful sentences. I draw hearts and sad faces. I often wish I could keymash. Sometimes “asglkhasgl;akhsglaks” says more than real words can. To me, this is the sign of a well-loved book, and I think that’s a beautiful thing.